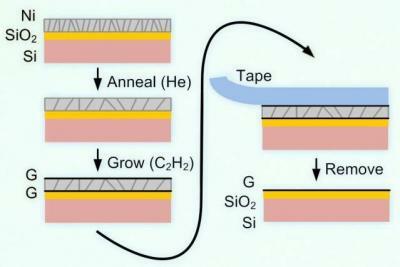 Researchers from MIT and the University of Michigan developed a new way to deposit graphene on nonmetal substrates. Current methods usually involved growing graphene on metal substrates, but this creates problems when you try to transfer the material to a different substrates. The new method still grows the graphene on a metal substrate - but they do it in a way that grows the graphene on both sides of the metal substrate. The process starts with the nonmetal substrate of choice, which is coated with nickel. Using CVD, graphene is grown on the nickel - but the graphene forms two layers, one of them between the nickel and the nonmetal substrate. The nickel is then easily peeled off which leaves a single graphene layer on the nonmetal substrate. The researchers demonstrate this technique using a large glass (SiO2) substrate (made by Guardian Industries). They showed that this process can be used to make a scalable manufacturing process. There are still a lot of quality issues (and uniformity) to solve, but the potential for such a process is great.